Do Dogs Really Need a Protection from the Sun? Our pet companions also need protection from the sun. Dog sunscreen is the perfect way to prevent sunburns and rashes; and it comes in various forms: dog sunblock spray, wipes, cream and sticks. Caring for your dog’s skin and hair is a growing trend so let’s review what is the right sunscreen for dogs today! In this article, I’ll explain you why dogs need to be protected from the sun, and how to do it. 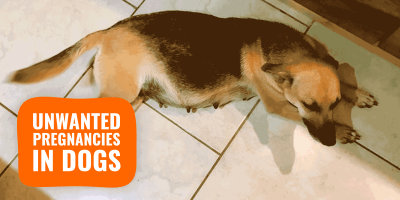 There are plenty types of dog sunscreens ranging from lotions, sprays and even organic baby sunscreens; so I want to shed some light on what’s good and what’s somewhat useless. Some of these UV rays, the UVA, represent a high risk of sunburn in dogs even with clouds or overcast. Bottom line, sun protection for your dog shouldn’t just be done during the hottest days of summer, but anytime the sun is giving that feeling of penetrating warmth. For a long time, dog sunscreens and sunblocks were not a priority for dog owners. 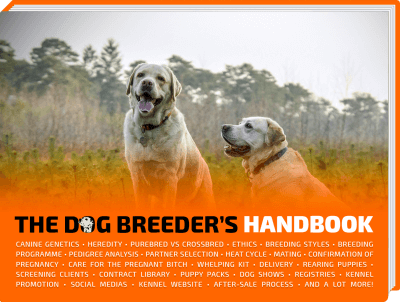 We’ve focused a lot on our own skins and let down our four-legged friends. However, advance research on pet skin types and dog coats have led manufacturers to come up with high-quality sunscreens for dogs that are safe. Remember to always protect your dog’s nose as it is more sensitive than the regular coat and skin. Like with everything, manufacturers and brands ruin everything. As soon as the early trials and sales looked promising, canine sun protection became the gold rush. Every brand, old or new, became a dog skin specialist releasing the hottest (pun intended) sunblock for dogs. So let’s list the best dog sunblockers below. The spray is probably the easiest way to apply sunscreen on your dog’s coat and skin. You can spray all over the body and work into the skin/coat using your hands or a brush. 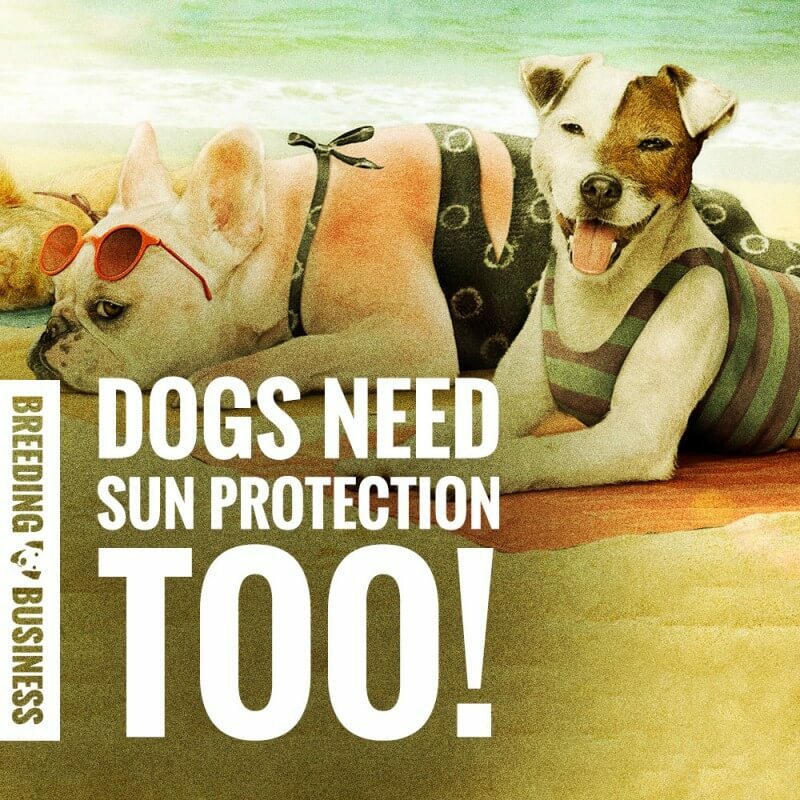 The Epi-Pet Sun Protector Spray is the only FDA-compliant dog sunscreen which is always a welcomed guarantee. If your dog is a wilful licker, this pet sun spray is veterinarian-developed and should not cause any harm. Given the alcohol and water contents and no oils, you should reapply after swimming just to re-enable the sun protection. 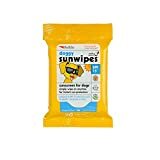 Very convenient to use, sun wipes for dogs do not offer the maximum protection. They are great to have in your bag or in the car for occasional uses. They are very cheap so it’s kind of a no-brainer but do not make them your go-to choice when it comes to protect your dog against a real hot sun. On the other hand, if your dog is hairy you may find sun wipes very difficult to apply., even with a medium-length coat. They will get dirty before you even reach the tail. Get the right sunscreen for your dog and don’t waste no time! 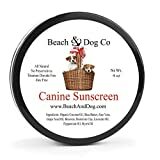 Unlike human sunscreen this sunscreen cream for dogs is safe, non-toxic and paraben-free. Both UVA and UVB will be screened and blocked efficiently. Remember that there is no 100% protection. The cream should be used preventively in priority on your dog’s nose, belly, pads and paws. Made using Shea Butter and Olive Oil, the cream will also be useful after a long day out in the sun as it helps the healing process of your dog’s paws and nose. 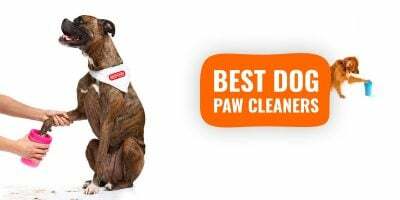 Overall, a great sun protection but more for the tummy (bare skin), nose and paws. The spray is still a must-use for all of your dog’s furry parts. Definitely! Finding a top quality dog sunscreen can be challenging so you may buy a baby sunscreen for your dog. When using it, start on a small patch just to make sure your dog doesn’t have a bad reaction to it but it should be fine as long as the sunblock is safe for baby or sensitive skins. There are plenty of baby-friendly sunscreens that will be biodegradable, titanium-free and organic. LureLuxe Organic Sunscreen is my absolute favourite and it would be my number one recommendation. The bottom line is that you should protect your dog from the sun’s ultraviolet rays, starting with the nose, belly and paws, to then finish off with the coat especially on short-haired dogs. Otherwise, your pooch is at a high risk of dog skin cancer or sunburn. The way you want to do it is entirely up to you. The spray is simply the easiest way to do it while the cream can last you longer. Please be careful as LureLuxe might be organic and all natural but it does contain Zinc oxide. Zinc oxide is a mineral used in creams and ointments to help prevent and treat minor skin burns. This mineral is also used paint, paper coating, rubber goods, and cosmetics. 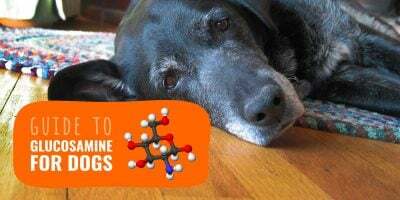 I have read on many sites that zinc oxide is harmful to dogs if ingested. *signal boost* the lurelux sunscreen linked should NOT be used on dogs! Great Blog..!! you share very interesting or very important points about dos sunscreen. it is really very helpful for those who have pets on there home. Its also very helpful for my business also. Thank you for sharing this information with us.